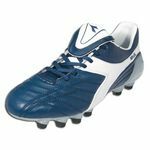 Diadora Soccer Cleats  find your best option. Which of the Diadora Soccer Cleats should you buy? 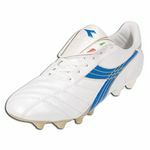 There are four models that you should look at: Diadora Attiva, Diadora Brasil, Diadora Totti and Diadora Carioca. 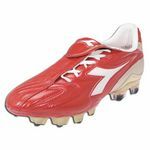 Despite Diadora cleats are not being a leading brand on the soccer market, I think they are just as good as soccer cleats made by their biggest competitors: Nike, Adidas or Puma. they are usually less expensive. The boot of choice for Francesco Totti. This is supremely comfortable soccer shoe. Outsole: Triple-density PU with Axeler TI and Flex Rotax Technologies and 14 circular studs. Available only for FG. I know there is a SG version with 6 screw-ins but I guess not available to the public at this time. Not available in Junior sizes. The mid-range version of LX K Pro model. The only significant difference, besides $50, is lack of External Heel Counter. Outsole: PU with Axeler and Flex Rotax Technologies and 14 circular studs. Recommended for competitive and advanced players. The least expensive, full-grain leather version of Diadora LX K Pro. Available for FG and HG (Turf - multi-studded rubber outsole). Available in Junior sizes: 1-6. Note: Synthetic upper (LX MD Jr). Recommended for beginners and recreational players. Also good option for competitive players with lower budget. The previous signature boots of Francesco Totti. Outsole: PU with Axeler TI and Flex Rotax Technologies and 14 laminar shape studs with cylindrical stud points (Rotax stud design). Available in Junior sizes: 1-6. Note: Synthetic upper. Recommended for advanced players. Junior model good for beginners. Less expensive version of Maximus RTX 14. Upper: Water resistant Supreltech synthetic leather. Outsole: Dual density TPU with Flex Rotax and 14 laminar shape studs with cylindrical stud points (Rotax stud design). Recommended for beginners and recreational players. Second version of Maximus RTX 14. The biggest changes are in the upper. Extremely asymmetrical lacing creates much bigger, laces-free striking area. Extended external heel counter doesn't make these cleats heavier than their previous version. Actually surprisingly these Diadora soccer cleats are a bit lighter and...less expensive. Great option for those who prefer smooth upper surface. Outsole: PU with Axeler and 14 Rotax studs (laminar shape studs with cylindrical stud points). Available in Junior sizes: 1-6 (MD PU Jr). Upper: Full-grain Leather; Outsole: 12 molded studs with Axeler Tech. 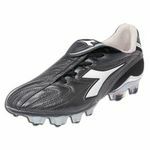 Too many differences to call these Diadora soccer cleats as a "less expensive version" of Axeler RTX 14. They are more like an upgraded version of Brasil Clasico MD PU. 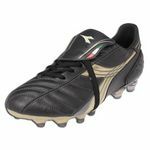 Good choice for Kangaroo Leather cleats lovers with...low budget. 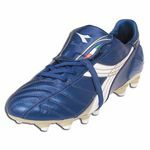 These cleats feature all the most important Diadora's technologies making them very comfortable shoes for decent price. Outsole: PU with Axeler technology and 12 specially tapered studs. Available for FG, HG (TF - multi-studded rubber with Axeler) and SG (6 removable conical studs with Axeler). The least expensive true-leather boots by Diadora. Outsole: PU with 12 molded studs. Available for FG and HG (TF - multi-studded rubber with Axeler). Recommended for beginners, recreational and competitive players. 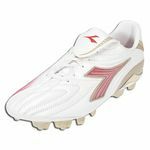 The most significant difference between Diadora soccer cleats is their type of outsole (bottom of the shoe), stud shape to be exact, determining types of surfaces these cleats are suitable for. Rotax (RTX 12) - specially tapered studs designed to provide better traction with reduced stud pressure. The circular positioning of the studs facilitates the natural turning movement of the foot. Although RTX 12 soccer cleats are recommended for use on Firm, natural surfaces, they are also adequate for Soft grounds (not in an extreme conditions, of course). MD  circular, molded cleats with addition of Axeler Technology make soccer cleats suitable for Hard and Firm grounds. RTX 14 - re-engineered version of RTX 12. Spring studs with cylindrical stud points offer increased shock absorption. The laminar shape studs guarantee maximum traction. MG 14 - Flex Rotax system specifically arranges 14 circular studs to facilitate forefoot rotation and release with exact forefoot flexion. MG 14 outsole is fitted to be used on different types of surface (multi-ground). 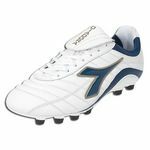 What I like the most about Diadora soccer cleats, besides reasonable prices is that almost all Diadora's technologies had been developed to significantly increase over all comfort. Not some fancy stuff that supposedly increase the power of your shot, or make your passes more accurate, or help you "band it like Beckham" or run faster than Donovan. Nothing like that. 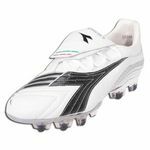 Diadora just simply concentrate all its resources to manufacture the most comfortable soccer cleats. And comfort of your feet will definitely help you to play better. 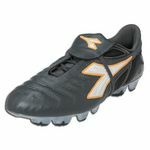 Selecting Soccer Cleats - Selecting Soccer Cleats, the most important part of soccer equipment, could be a torture. My Recommendations and Factors to Consider will help you decide, which soccer cleats are right for you. 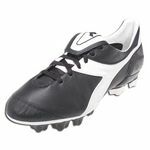 Reviews of Online Soccer Stores - There are probably as many online soccer stores as types of soccer cleats. This made me realize that finding valuable, respectful and reliable place to buy soccer equipment could be as hard as choosing one properly. Avoid a headache and use my recommendations for the best online soccer stores on the Internet. Shop wisely and secure. What are your favorite soccer cleats? - Everyone, maybe not everyone, but every soccer player has his favorite soccer cleats. It could be a very specific model, like Puma v1.06 I FG K or any Nike soccer cleats or just all Kangaroo Leather cleats. What are your preferences? What are your favorite soccer cleats and why? Have a minute...let us know.